When you work hard enough at something and it finally pays off, it seems like a gift. Then again, when you go out opening day and take your limit of grouse, it seems like a right, granted by effort. With the monsoons threatening most afternoons, getting out early is your only guarantee of high elevation relaxation. Grouse hunting used to be known as the gentlemen’s game because you could sleep in, shoot grouse, and come back in for scotch and a session of backgammon before your vision was reduced to candlelight. It is thought that grouse do not like their feet getting wet in the dew of the morning, so they typically don’t fly down until the ground cover has dried a bit. Contrary to what you might think, dew does exist in Colorado, at least above 10k in elevation. 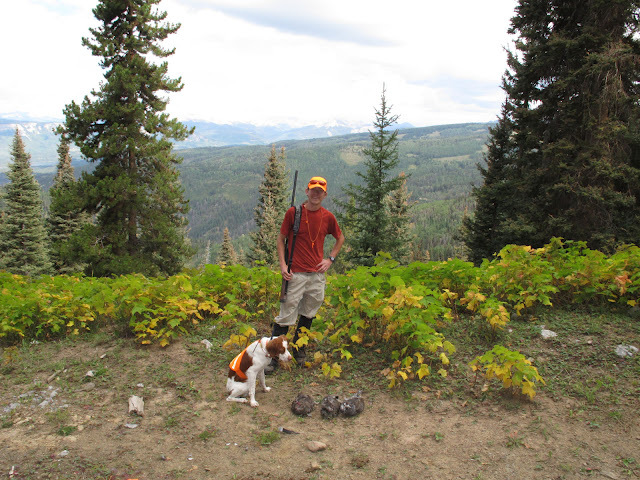 Last year was my first grouse season with a bird dog and my first hunting season in Colorado. I hunted high and low, East and West of Durango and only shot two blue’s all season. I decided to find them in my backyard this year. Driving along at elevation trying to pick a logging road to hunt, the first warm light of the morning flecked by a browsing blue grouse. In a way, blue’s are lot like humans; they like to sleep in past first light, don’t like getting wet, and are easy to catch once found. They also get a bad rap for being among the dumbest of grouse species; flying up in a nearby branch, huntable by the primitive rock method. Like most game, respect is a learned principle. I believe that when you look for something, all of the sudden it is impossible to find, yet if you forget about it, opportunities abound. Lessons I wish I had learned earlier in life. After choosing a road to hike in pursuit of grouse, Fiddle and I began our annual games once again. By 10:30am a limit of grouse had been harvested. Fiddle sight pointed the first two and flush steadied the second. Now that my dog has been trained to retrieve, it really was quite enjoyable watching him work with wild birds and fetch them out of areas I would have a hard time getting to (not to mention find). Sometimes hunting seems more like work than anything else, other times it is more spiritual and reflective, then there are the moments where you feel like you just went out and got the job done. When success is had early, it is either due to luck or pre-season prep and training, generous proportions of both is best case scenario. This entry was posted in Hunting and tagged blue, Brittany, Colorado, dusky, Grouse, gundog, hunting, Spaniel. Bookmark the permalink.